Synonyms and Other Names: Apollonia melanostoma (Pallas, 1814), Apollonia melanostomus (Pallas, 1814); see Stepien and Tumeo (2006) for name change, and Stepien and Neilson (2013) for clarification on taxonomy and nomenclature. Identification: Distinguishing characteristics have been given by Berg (1949), Miller (1986), Crossman et al. (1992), Marsden and Jude (1995), and Hubbs et al. (2004). Young round gobies are solid slate gray. Older fish are blotched with black and brown and have a white to greenish dorsal fin with a black spot at the posterior base. This goby is superficially similar to native sculpins but can be distinguished by the presence of fused pelvic fins (sculpins have two separate fins) (Marsden and Jude 1995; Hubbs et al. 2004). Native Range: Fresh water, prefers brackish (Stepien and Tumeo 2006). Eurasia including Black Sea, Caspian Sea, and Sea of Azov and tributaries (Miller 1986). Table 1. States with nonindigenous occurrences, the earliest and latest observations in each state, and the tally and names of HUCs with observations†. Names and dates are hyperlinked to their relevant specimen records. The list of references for all nonindigenous occurrences of Neogobius melanostomus are found here. Ecology: The Round Goby perches on rocks and other substrates in shallow areas, yet it has also been reported to flourish in a variety of habitat types including open sandy areas and in abundant aquatic macrophytes (Jude and DeBoe 1996; Clapp et al. 2001). This goby also has a well developed sensory system that enhances its ability to detect water movement. This allows it to feed in complete darkness, giving it an advantage over other fish in the same habitat (Wisconsin Sea Grant 2008). The zebra mussel may have facilitated the invasion of the Round Goby and other Eurasian species by providing an abundant food source (Ricciardi and MacIsaac 2000). Means of Introduction: Introduced into the Great Lakes from the Black Sea via freighter ballast. Spread to Lake Superior by freighters operating within the Great Lakes. Round Goby distribution in the Baltic Sea was partially determined by shipping activity, thus it is likely the same applies to the Great Lakes populations (Kotta et al. 2016). Impact of Introduction: The distribution of the Round Goby around the inshore areas of the Black and Caspian seas indicates their potential for widespread occupation of inshore habitats with cover, especially plants or rocky rubble, in the lower Great Lakes, yet they can migrate to deeper water 50-60 m in winter (Jude et al., 1992). The numbers of native fish species have declined in areas where the Round Goby has become abundant (Crossman et al., 1992). This species has been found to prey on darters, other small fish, and Lake Trout eggs and fry in laboratory experiments. They also may feed on eggs and fry of sculpins, darters, and Logperch (Marsden and Jude, 1995) and have also been found to have a significant overlap in diet preference with many native fish species. 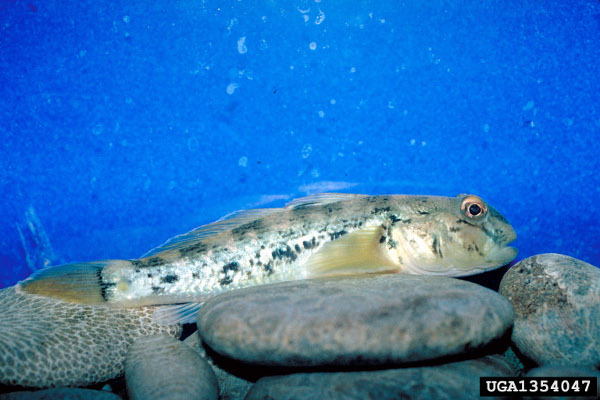 French and Jude (2001) suggested that Round Goby competes with Rainbow Darter (Etheostoma caeruleum), Logperch (Percina caprodes), and Northern Madtom (Noturus stigmosus) for small macroinvertebrates; however, Burkett and Jude (2015) found that gobies exhibited little diet overlap with most small benthic fishes. Mottled Sculpins (Cottus bairdi) have been particularly affected since the establishment of N. melanostomus (Marsden and Jude 1995). This is almost certainly due to competition with sculpins for spawning sites in large Round Goby (greater than 100 mm), for space in medium Round Goby (60-100 mm) and for food in small Round Goby (less than 60 mm) (Janssen and Jude 2001). Janssen and Jude (2001) argued that the main cause of the dramatic decline in the native Mottled Sculpin population is due to nesting interference with Round Goby; the other competition factors having a less severe impact, although they acknowledge the need for further research on food competition. Adults aggressively defend spawning sites and occupy prime spawning areas, keeping natives out (Marsden and Jude 1995; Dubs and Corkum 1996). Laboratory experiments have shown that the more aggressive N. melanostomus will evict C. bairdi from rock shelters that are being used for spawning or daytime predator evasion (Dubs and Corkum 1996). In trials where gobies were introduced into tanks with Mottled Sculpin residents, the gobies approached and chased the resident sculpin (Dubs and Corkum 1996). When sculpin were released into resident Round Goby tanks, the sculpin were chased and bitten (Dubs and Corkum 1996). Sculpin did not exhibit any aggressive behavior towards the gobies in any scenario (Dubs and Corkum 1996). In Calumet Harbor, there has been an absence of Mottled Sculpin nests and fish aged 0 since 1994, coinciding with N. melanostomus establishment (Janssen and Jude 2001). Neogobius melanostomus and C. bairdi both take daytime refuge from predators under rocks, emerging to feed nocturnally (Dubs and Corkum 1996). This space competition could displace C. bairdi into deeper and unprotected spaces where they can easily be predated. Competition for food between N. melanostomus and C. bairdi occurs most heavily when they are young (less than 60 mm), due to the overlap of an arthropod diet at this age (Janessen and Jude 2001). The diet of larger Round Gobies consists mainly of zebra mussels, which no other fish species of the Great Lakes consumes so heavily, allowing round gobies to uniquely exploit a resource that could fuel a population explosion (Vanderploeg et al. 2002). Walleye anglers in Detroit report that at times, all they can catch are gobies, which eagerly attack bait (Marsden and Jude 1995). The invasion of Round Goby into Lake Erie has had very real environmental and economic impacts. Beginning in 2004, The State of Ohio has closed the Smallmouth Bass fishery in Lake Erie during the months of May and June, due to high predation rates by gobies on nests affecting recruitment. Under normal circumstances male Smallmouth Bass guard nests and are effective in deterring gobies. When males are removed, gobies immediately invade and have been shown to eat up to 4,000 eggs within 15 minutes. The months of May and June normally account for 50 percent of the total Smallmouth Bass catch in Lake Erie so there will be a considerable loss in funds generated by recreational fishers (National Invasive Species Council 2004). Neogobius melanostomus introductions may also be a vector for the spread of avian botulism. The change in behavior of infected gobies make them preferred prey items to piscivorous birds (Yule et al. 2006). At Lake Erie, botulism infected birds had been feeding more on Round Goby compared to uninfected birds (Corkum et al. 2004). Increased abundance of Round Goby in the diet of double-crested cormorant (Phalacrocorax auritus) may reduce chick growth and reproductive success, due to a lower energy density compared to other native fishes (Ruetz et al. 2009), and thus could provide some control over cormorant populations (Van Guilder and Seefelt 2013). Round Goby may provide an entry point for polychlorinated biphenyls (PCBs) into trophic webs. Macksasitorn et al. (2015) found a weak correlation between sediment and goby tissue PCB concentrations, with smaller gobies having higher PCB concentration. Not all impacts of the introduced Round Goby are negative. Round Gobies comprise the majority of the diet for Lake Erie water snakes (Nerodia sipedon insularum), and the abundance of gobies has been credited for the increase in population size, increased growth rates, and larger body size of the snakes (King et al. 2006). Due to their increase in abundance, the Lake Erie water snake was removed from the federal Endangered Species List in 2011. In addition, round gobies provide an abundant food source for several sportfishes including walleye (Taraborelli et al. 2010), yellow perch (Truemper and Lauer 2005), and largemouth/smallmouth bass (Steinhart et al. 2004; Taraborelli et al. 2010). Round goby became the primary food resource for smallmouth bass in New York waters of Lake Erie following invasion, with a marked decrease in crayfish consumption, and bass had a larger length-at-age in the post-invasion period (Crane and Einhouse 2016). Jacobs et al. (2017) used stable isotope analysis to examine Lake Sturgeon (Acipenser fulvescens) in Lake Ontario and lower Nigara River pre- and post-invasion of Round Goby, finding an increased trophic position with age, an increased rate of δ15N enrichment, and a marked importance of Round Goby in Lake Sturgeon diets in the post-invasion period. Jacobs et al. (2017) suggest that high abundance of this novel food source has altered Lake Sturgeon feeding ecology and may have increased population growth and success. Remarks: The diet of Round Gobies collected in the United States consists of aquatic insects, zebra mussels, and some native snails. Studies have shown a single goby can eat as many as 78 zebra mussels per day. This goby is a very pugnacious fish that feeds voraciously, and, as such, it may prey on the young of other deepwater bottom dwellers such as sculpins, darters, and Logperch. Its well-developed lateral line may help it out compete natives for food in the murky Great Lakes waters. Its pugnacious appetite is not reserved solely for other species; Round Goby males are known to eat other males eggs when they take over a spawning ground (Janssen and Jude 2001, and references within). Adult Round Goby also have been known to feed on smaller conspecifics. Pettitt-Wade et al. (2015) examined trophic niche breadth, plasticity, and overlap between Round and Tubenose gobies in Lakes Superior and St. Clair using stable isotope analysis. They found a higher isotopic trophic position and generally higher isotopic nichc breadth and plasticity in Round Goby, with little overlap between size-matched Round and Tubenose gobies, and suggested that this increased isotopic niche breadth and plasticity has assisted in the establishement success of Round Goby in the Great Lakes (widely abundant and distributed vs. low abundance and localized distribution of tubenose goby). The Round Goby's aggressive nature may allow individuals to dominate prime spawning sites, making these sites unavailable to natives. There is a long spawning period during which individuals can spawn every 20 days, while they aggressively defend their nests (Jude et al. 1992). Although early researchers expected introduced round gobies to be restricted to near-shore rocky or weedy habitats, the species has since been captured at depths as great as 21.5 m (T. Cavender, Ohio State University, Columbus, OH, personal communication). Divers have found an unusual characteristic of N. melanostomus. When divers overturn rocks to expose Round Gobies in their daytime shelters, more gobies come to the site to feed on exposed prey but also to observe the divers (Janssen and Jude 2001). Yet if a predator approaches, such as a Smallmouth Bass (Micropterus dolomieu) or a Rock Bass (Amploplites rupestris), the gobies will seek shelter (Janssen and Jude 2001). Although the species exhibits two pigmentation morphs and investigations were planned to determine whether more than one introduction of Neogobius occurred in the Great Lakes (T. Cavender, Ohio State University, Columbus, OH, personal communication), only N. melanostomus has been observed. Introduced populations of Round Goby in the Great Lakes show reduced diversity and numbers of parasites compared to populations from its native range as well as to native Great Lakes fishes, providing some support for the 'enemy release hypothesis' for invasion success (Kvach and Stepien 2008; Gendron et al. 2012). However, Gendron et al. (2012) found that gobies from Lake St. Clair (one of the earliest introduced populations) showed an increase in parasite diversity and density over time. Round Goby has been shown to exhibit phenotypic plasticity in some life history characteristics, such as reproductive traits like number and size of mature oocytes, and this plasticity has been suggested to enhance establishment success at invasion fronts (Hôrková and Kovác 2015). Phenotypic plasticity has also been shown in Round Goby to maintain or regain homeostasis after rapid temperature changes, thus increasing its invasion success (Wellband and Heath 2017). Coulter et al. (2015) examined the influence of various habitat characteristics (e.g., wetlands vs open water, productivity, zooplankton and fish community diversity) on the abundance of Round Goby at several sites in Lakes Michigan and Huron, finding that catch per unit effort was generally related to biological productivity but the direction and strength of the relationship varied across sites. Adrian-Kalchhauser et al. (2017) suggest that there is no direct evidence for the direct attachment of egg clutches by Round Goby to aquatic vessels, a commonly suggested introduction vector for Ponto-Caspian gobiids, and that this concept should be treated as an untested hypothesis. Round Goby is one of the most frequently found prey items in the diet of the Double-Crested Cormorant in the southern basin of Lake Michigan (Madura and Jones 2016). Voucher specimens: Ohio (OSM, UF 98888); Michigan (UMMZ); Illinois (INHS). Indiana (INHS, UMMZ 224874). Voucher specimens from the Canadian side of the St. Clair River (UMMZ 217682, 218279; ROM 60675); Lake Ontario (Ontario Federation of Anglers and Hunters, Peterborough, Ontario). Adrian-Kalchhauser, I., A. N'Guyen, P.E. Hirsch, and P. Burkhardt-Holm. 2017. The invasive round goby may attach its eggs to ships or boats – but there is no evidence. Aquatic Invasions 12(2):263-267. http://www.aquaticinvasions.net/2017/AI_2017_Adrian-Kalchhauser_etal.pdf. Anonymous. - Ontario Ministry of Natural Resources, Niagara Falls, Ontario, Canada. Balshine, S., A. Verma, V. Chant, and T. Theysmeyer. 2005. Competitive interactions between round gobies and logperch. Journal of Great Lakes Research 31(1):68-77. Bergstrom, M.A., L.M. Evrard, and A.F. Mensinger. 2008. Distribution, abundance, and range of the round goby, Apollonia melanostoma, in the Duluth-Superior Harbor and St. Louis River Estuary 1998-2004. Journal of Great Lakes Research 34:535-543. Bowen, A. - US Fish and Wildlife Service, Alpena, MI. Busiahn, T. - US Fish and Wildlife Service, Ashland, WI. Charlebois, P. - Illinois-Indiana Sea Grant, Zion, IL. Clapp, D.F., P.J. Schneeberger, D.J. Jude, G. Madison, and C. Pistis. 2001. Monitoring round goby (Neogobius melanostomus) population expansion in eastern and northern Lake Michigan. Journal of Great Lakes Research 27(3):335-341. Corkum, L.D., M.R. Sapota, and K.E. Skora. 2004. The round goby, Neogobius melanostomus, a fish invader on both sides of the Atlantic Ocean. Biological Invasions 6:173-181. Czypinski, G.D., A.K. Hintz, M.T. Weimer, and A. Dextrase. 2000. Surveillance for ruffe in the Great Lakes, 1999. U.S. Fish and Wildlife Service, Ashland, WI. 29 pp. Czypinski, G.D., A.K. Bowen, M.T. Weimer, and A. Dextrase. 2002. Surveillance for ruffe in the Great Lakes, 2001. U.S. Fish and Wildlife Service, Ashland, WI. 36 pp. Dennison, S. - Metropolitan Water Reclamation District of Greater Chicago, Chicago, IL. Dermott, R. - Fisheries and Oceans, Burlington, Ontario, Canada. Dextrase, A. - Ontario Ministry of Natural Resources, Peterborough, Ontario, Canada. Dietrich, J.P., B.J. Morrison, and J.A. Hoyle. 2006. Alternative ecological pathways in the eastern Lake Ontario food web—round goby in the diet of lake trout. Journal of Great Lakes Research 32(2):395-400. Dubs, D.O.L., and L.D. Corkum. 1996. Behavioral interactions between round gobies (Neogobius melanostomus) and mottled sculpins (Cottus bairdi). Journal of Great Lakes Research 22:838-845. Dunning, D.J., Q.E. Ross, E.T. Euston, and S.A. Haney. 2006. Association between the catches of round gobies and smallmouth bass on the Upper Niagara River. Journal of Great Lakes Research 32(4):672-679. Francis, J. - Indiana Department of Natural Resources, Michigan City. French, J.R.P, III and D.J. Jude. 2001. Diets and diet overlap of nonindigenous gobies and small benthic native fishes co-inhabiting the St. Clair River, Michigan. Journal of Great Lakes Research 27(3):300-311. Gendron, A.D., D.J. Marcogliese, and M. Thomas. 2012. Invasive species are less parasitized than native competitors, but for how long? The case of the round goby in the Great Lakes-St. Lawrence Basin. Biological Invasions 14:367-384. Goehle, M. - U.S. Fish and Wildlife Service, Amherst, NY. Hintz, A. 2000. Lake Huron exotic fish surveillance in 1999. U.S. Fish & Wildlife Service, Fishery Resources Office, Alpena, Michigan. 13 pp. Hintz, A. - U.S. Fish and Wildlife Service, Alpena, MI. Hogan, L.S., E. Marschall, C. Folt, and R.A. Stein. 2007. How non-native species in Lake Erie influence trophic transfer of mercury and lead to top predators. Journal of Great Lakes Research 33(1):46-61. Hubbs, C.L., K.F. Lagler, and G.R. Smith. 2004. Fishes of the Great Lakes Region. Revised edition. University of Michigan Press, Ann Arbor, MI. Janssen, J., and D.J. Jude. 2001. Recruitment failure of mottled sculpin Cottus bairdi in the Calumet Harbor, southern Lake Michigan, induced by the newly introduced round goby Neogobius melanostomus. Journal of Great Lakes Research 27(2):319-328. Jensen, D. - Minnesota Sea Grant, Duluth, MN. Johnson, T.B., D.B. Bunnell, and C.T. Knight. 2005. A potential new energy pathway in Central Lake Erie: the round goby connection. Journal of Great Lakes Research 31(Suppl. 2):238-251. Keppner, S. - US Fish and Wildlife Service, Amherst, NY. King, R.B., J.M. Ray, and K.M. Stanford. 2006. Gorging on gobies: beneficial effects of alien prey on a threatened vertebrate. Canadian Journal of Zoology 84:108-115. Knight, C. - Ohio Department of Natural Resources, Fairport Harbor, OH. Knight, C. 1994. The round goby: Lake Erie's newest invader. Ohio Chapter American Fisheries Society (OCAFS) Newsletter 21(3):5. Kotta, J., K. Nurkse, R. Puntila, and H. Ojaveer. 2016. Shipping and natural environmental conditions determine the distribution of the invasive non-indigenous round goby Neogobius melanostomus in a regional sea. Estuarine, Coastal and Shelf Science 169:15-24. Krakowiak, P.J., and C.M. Pennuto. 2008. Fish and macroinvertebrate communities in tributary streams of Eastern Lake Erie with and without round gobies (Neogobius melanostomus, Pallas 1814). Journal of Great Lakes Research 34(4):675-689. Kvach, Y., and C.A. Stepien. 2008. Metazoan parasites of introduced round and tubenose gobies in the Great Lakes: support for the "enemy release hypothesis". Journal of Great Lakes Research 34:23-35. Lapierre, L. - Service de la faune aquatique, Quebec, Quebec, Canada. Lauer, T. - Purdue University, West Lafayette, Indiana. Lederer, A., J. Massart, and J. Janssen. 2006. Impact of round gobies (Neogobius melanostomus) on dreissenids (Dreissena polymorpha and Dreissena bugensis) and the associated macroinvertebrate community across and invasion front. Journal of Great Lakes Research 32(1):1-10. Madison, G. - Michigan Department of Natural Resources, Gladstone, MI. Madura, P.T., and H.P. Jones. 2016. Invasive species sustain double-crested cormorants in southern Lake Michigan. Journal of Great Lakes Research 42(2):413-420. Marsden, J.E., and D.J. Jude. 1995. Round gobies invade North America. Fact sheet produced by Sea Grant at Ohio State University, Columbus, OH. Miller, P.J. 1986. Gobiidae. Pages 1019-1085 in P. J. P. Whitehead, M.L. Bauchot., J.C. Hureau, J. Nielsen, E. Tortonese, editors. Fishes of the north-eastern Atlantic and the Mediterranean, volume III. United Nations Educational, Scientific and Cultural Organization, Paris, France. Morrison, H.A., D.M. Whittle, and G.D. Haffner. 2000. The relative importance of species invasions and sediment disturbance in regulating chemical dynamics in western Lake Erie. Ecological Modelling 125(2-3):279-294. Murry, C. - Pennsylvania Fishing and Boating Commission, Erie, PA.
National Invasive Species Council. 2004. Weekly Notice May 27, 2004-June 3, 2004. Nelson, D. - University of Michigan Museum of Zoology, Ann Arbor, MI. Ng, C.A., M.B. Berg, D.J. Jude, J. Janssen, P.M. Charlebois, L.A.N. Amaral, and K.A. Gray. 2008. Chemical amplification in an invaded food web: Seasonality and ontogeny in a high-biomass, low-diversity ecosystem. Environmental Toxicology and Chemistry 27(10):2186-2195. Ochs, C.L., A.J. Laframboise, W.W. Green, A. Basilious, T.B. Johnson, and B.S. Zielinski. 2013. Response to putative round goby (Neogobius melanostomus) pheromones by centrarchid and percid fish species in the Laurentian Great Lakes. Journal of Great Lakes Research 39:186-189. Poos, M., A.J. Dextrase, A.N. Schwalb, and J.D. Ackerman. 2010. Secondary invasion of the round goby into high diversity Great Lakes tributaries and species at risk hotspots: potential new concerns for endangered freshwater species. Biological Invasions 12:1269-1284. Ricciardi, A., and H.J. MacIsaac. 2000. Recent mass invasion of the North American Great Lakes by Ponto-Caspian Species. Trends in Ecology and Evolution 15:62-65. Rollo, A., G. Andraso, J. Janssen, and D. Higgs. 2007. Attraction and localization of round goby (Neogobius melanostomus) to conspecific calls. Behaviour 144:1-21. Ruetz, C.R., III, D.L. Strouse, and S.A. Pothoven. 2009. Energy density of introduced round goby compared with four native fishes in a Lake Michigan tributary. Transactions of the American Fisheries Society 138(4):938-947. Savino, J.F., D.J. Jude, and M.J. Kostich. 2001. Use of electric barriers to deter movement of round goby. American Fisheries Society Symposium 26:171-182. Scobie, C. - Ontario Federation of Anglers and Hunters, Peterborough, Ontario, Canada. Steinhart, G.B., R.A. Stein, and E.A. Marschall. 2004. High growth rate of young-of-the-year smallmouth bass in Lake Erie: a result of the round goby invasion? Journal of Great Lakes Reserach 30:381-389. Taraborelli, A.C., M.G. Fox, T.B. Johnson, and T. Schaner. 2010. Round goby (Neogobius melanostomus) population structure, biomass, prey consumption, and mortality from predation in the Bay of Quinte, Lake Ontario. Journal of Great Lakes Research 36:625-632. Truemper, H.A., and T.E. Lauer. 2005. Gape limitation and piscine prey size-selection by yellow perch in the extreme southern area of Lake Michigan, with emphasis on two exotic prey items. Journal of Fish Biology 66:135-149. Van Guilder, M.A., and N.E. Seefelt. 2013. Double-crested (Phalacrocorax auritus) chick bioenergetics following round goby (Neogobius melanostomus) invasion and implementation of cormorant population control. Journal of Great Lakes Research 39:153-161. Veraldi, F. - US Army Corps of Engineers, Chicago, IL. Weber, M.J., J.M. Dettmers, D.H. Wahl, and S.J. Czesny. 2011. Size preferences and behaviors of native yellow perch foraging on invasive round gobies. Journal of Great Lakes Research 37(3): 584-587. Wellband, K.W., and D.D. Heath. 2017. Plasticity in gene transcription explains the differential performance of two invasive fish species. Evolutionary Applications(10):563-576. https://www.ncbi.nlm.nih.gov/pmc/articles/PMC5469171/pdf/EVA-10-563.pdf. Yule, A.M., I.K. Barker, J.W. Austin, and R.D. Moccia. 2006. Toxicity of Clostridium botulinum Type E neurotoxin to Great Lakes fish: implications for avian botulism. Journal of Wildlife Diseases 42(3):479-493. Author: Fuller, P., Benson, A., Maynard, E., Neilson, M.E., Larson, J., and Fusaro, A.